MyIntent supports leaders in educational roles - such as teachers, educators, and camp counselors - in teaching mindfulness and social-emotional learning through our "What's Your WORD?" activity. Educators across the country are pairing our "What's Your WORD?" question with an activity such as a writing assignment and then creating MyIntent bracelets for their students as a daily reminder to live their WORD. (e.g. schools, camps, after-school programs, etc). A credit card is required for orders less than $500 (after discount). For orders over $500 (after discount), we also accept Purchase Order. *Discount valid for the items listed below in our Education Collection. For bracelets and refill tokens, discount is valid on BRASS items only. 1. How can MyIntent help my school? 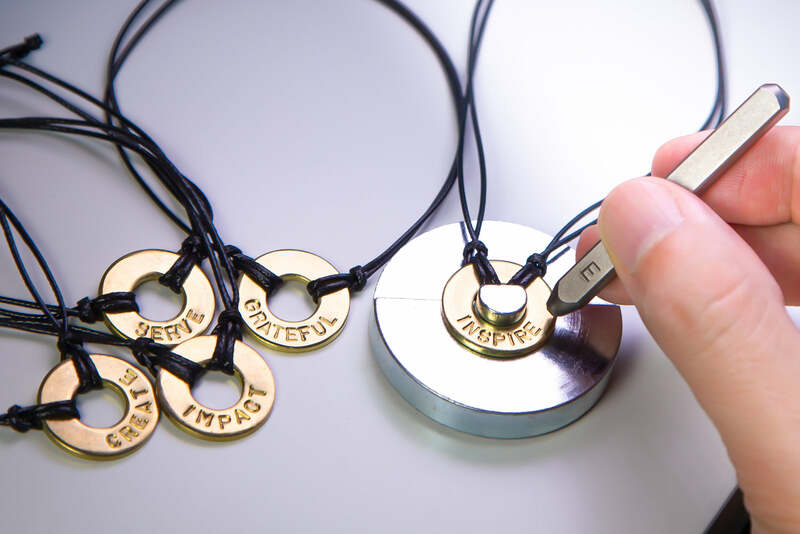 MyIntent's "What's Your WORD?" activity is an interactive way to supplement and enhance Social Emotional Learning and Positive Psychology programs, as well as, facilitate team building. Download our PDF showcasing how teachers and administrators around the nation are using MyIntent's "What's Your WORD?" 2. Can I make and use the bracelets for fundraising at my school? 3. Why is the Educator discount only valid on BRASS items? About 10% of people are allergic to Nickel. Therefore, we've limited the Educator discount to BRASS items only to mitigate the chance that your students will have an allergic reaction. 4. Why aren't necklaces included in the Educator discount? We've excluded necklaces to prevent any chance of necklaces becoming a hazard while children play on playgrounds, during sports, etc. 5. What age is this activity appropriate for? Maker Kits are only designed to be used with students ages 13 and over. 6. Does MyIntent's token contain lead? Our Brass tokens have been certified by a 3rd party agency to pass ASTM F963-17 for use with students (Aug 30, 2018).